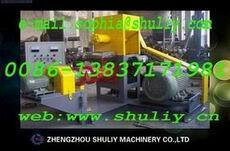 The Floating-Feed Pellet Machine can make many kinds of fodder for different kinds of animal fodder. It can make poultry-fodder, pet-fodder, as well as aquaculture-fodder and fishery feed, which is also called floating feed. It is applied to the pretreatment of the animal fodder, so as to reduce loss of nutrition, advance the protein content, So the fodder will be digested easier by animals. The poultry-fodder can feed chicken, rabbit, sheep, pig, horse cattles and so on. The pet-fodder can feed dogs ,cats, goldfish etc The Fishery-feed can feed the fish, shrimps, crab, eel ,catfish, batrachia and so on. 1.Fishfeed pellet machine is a new-style line for improving market of fish feed pellet machine, which is developed successfully with our many years exploit experiences on food machinery. 2.Producing floating/sinking fish feed pellets, we can provide users the special usable aquatic feed formulations. 3.Ensure that the hardness of feed, water resistance, broken resistance, stability, prevention of water pollution, it can sterilize the food, make the pellet food nutrient-rich, easy to absorb.